Go down the stairs, then go north while avoiding falling down! and go on to the right and top. Push the lever to the bottom to make the sun shine in, then go back to the first underground level where the sun made the ice thaw. 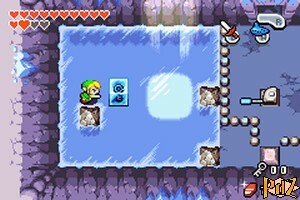 Fall into the hole, push the ice cube to the bottom, then to the right and pick up the Small Key. Push the block, go back to the first underground level, go back left and open the door. Jump into the hole and go right. To begin with, push the bottom block down, then left. Then push the top block to the left and the one with the key to the left as well. Now, push the block with the key to the top, then to the left, bottom, left, top, right and pick up the Big Key. Push the lever to the top to make the sun go away and go back to the first underground level. Go right, down and open the boss door to the south. Go southwest, then south and pick up the Map in the chest. Backtrack, swim to the north (dive to avoid the roll), then to the west and climb the stairs. Swim east, then south and vacuum the toadstool to go across. Walk on the switch, then swim to the waterfall. Go on south and read the stele on the left. Walk on the switch and go on east. Swim between the blocks which form a kind of pot and search the bottom by diving to find another Small Key. Now go back west, then north and climb the wall next to the waterfall. Go north, open the door, then walk on the switch. 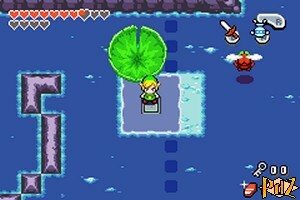 Climb on the water lily and with the Gust Jar, go around the room and fall into the waterfall. Go again southwards, then east and walk on the switch. Use the water lily again and go east. Fight the caterpillar like you did the first time, then go up and pick up the Compass in the chest. Get back on the water lily, head back west and go on north. Walk on the switch, then swim north. Open the chest to the north to get 50 rupees and go south. Push the far north block to the bottom, then the far east block to the left, then push this same block to the bottom, then to the left and to the top on the switch. Get back on the water lily and go around the room to take the passage on the top right. Go ahead carefully towards north while sticking to the left wall and go up. Climb the steps, then the stairs and fight the three enemies to make a warp tile appear. Go on down and left. Create a clone on the slabs to the south, then push the lever. Half of the room is then bathed in sunlight. Jump and go southeast, then up. Pick up a Kinstone in the chest and go on east. Go south carefully, get another Kinstone from the chest, then go behind the green chain and take the passage to the left. Go left, then up and go down the stairs. Go down the following stairs, push the lever, then go back up, push the other lever to the bottom, then go down the stairs again and push the lever again to get a Small Key. Go back two floors up, go down and open the door. Push the lever and be ready to fight a blue slime! Attack it like the first one when it doesn't emit electricity, then open the chest to get the Lantern! Go back up, light your Lantern to melt one of the big blocks, put it away and go down the stairs. 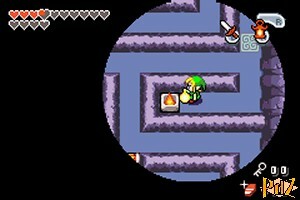 Use the lantern to get 100 rupees from the chest and go on to the east. Light your Lantern again to fight three enemies and go on to the right. Go on in the room by lighting up the four torches. There is a Kinstone in the northeast corner, another one to the west and a third one in the middle. Blow up the east wall and go on. Get rid of all the enemies, then pick up the Small Key, go back right and open the door to the northwest. Go across the room towards west while avoiding the enemies, then go on carefully to the north. Take the passage to the top and go on left. Create a clone on the slab above or under you and push the upper block to the left. Then create a clone on the slab to your left or your right and quickly push the next block down and once again the third block down (but only once). Create a last clone above or under you, push the upper block to the right and go up. Start by pushing the bottom block to the left, then the left block up, then left. Then go back to the right, stand on the far south slab and create a second clone on the second slab from the top. Then quickly and carefully aim for the next two switches, then go down. There, push the northeast button to the top to create a square and go left. At first get rid of the enemies, then melt the ice block. Stand on one of the top slabs, create a clone under you, then push the block. Next go between the two torches and climb the stairs to the left. 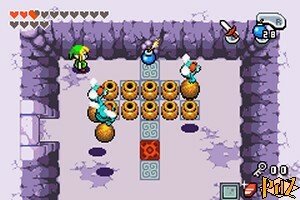 Use the Lantern on each of the nine torches as fast as you can so they're all lit at the same time and go on left. Swim south and go on to the right. 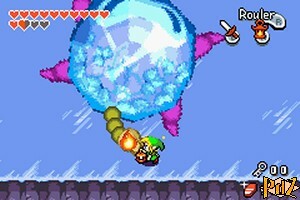 To begin with, step on the switch to create a second warp tile, then drop a bomb against the top wall and go on. Get rid of the two caterpillars, then go right and up. Cross northwards, climb the stairs, then climb the steps, go down and right. Create a clone on the slabs and push the lever to light the second half of the room. Jump and go down to meet the boss. This boss isn't hard to defeat, but can be a real pain! Start by equipping your Small Shield and send its mud balls back at it three times, but don't get too close, because it could vacuum you. Then, it will freeze the ground. Light the Lantern and do your best to burn its tail. Avoid the falling rocks, then send it back its mud balls again. After burning its tail once more, it will spit ink to darken the room. Use the Lantern and be ready to deflect its mud balls one last time. Then you will be rewarded with the Water Element. Pick up the Heart Container, then step on the warp tile. The two remaining chests withhold 100 mysterious shells and a Kinstone.